A new beach gadget has broken a Kickstarter fundraising record. The gadget is part blender, stereo, cooler, and bottle opener. It’s the most funded Kickstarter project in history, with 55,000 backers and $11 million raised. It’s got a USB charging port and a removable speaker. Inside, there’s a cutting board with a slot for a knife and a light in case you want to party into a night. There’s also a blender on top. 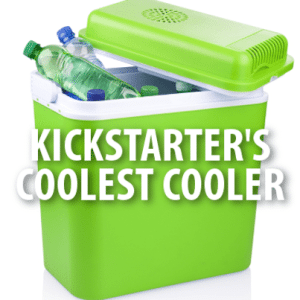 The creator of the gadget, Ryan Grepper, said that the party at a tailgate or beach party is always around the cooler and so it’s a party in the box. The last day for the Kickstarter campaign is August 29, 2014 at 6 p.m. Anyone who backs it on Kickstarter gets to be one of the first people in the world to get one. They should be for sale in February. The retail price is around $299, but on Kickstarter, you’ll save over $100. In case you were wondering, this really cool gadget-filled cooler is called The Coolest Cooler. Today Show: Most Expensive Divorce Ever? Then it was onto the most expensive divorce ever. Harold and Sue Ann Hamm are splitting with $20 billion at stake, the most at stake in any marriage in history. Harold Hamm is an Oklaholma oil baron and one of the richest men in the world. His wife of 25 years, Sue Ann, an economist and lawyer, filed for divorce claiming he was unfaithful. Her lawyers have gone to court arguing she deserves an equitable share, which could be half the family fortune. It’s important to know that this is one of the most expensive divorces ever. The money eclipses, for example, actor Mel Gibson’s split from wife Robyn Moore, which only had $425 million at stake, or Michael Jordan’s split from Juanita Jordan, which had $168 million at stake. Harold’s lawyers are arguing that Harold’s fortune was dumb luck and had nothing to do with business savvy on his part or his wife’s part. Unless a settlement is reached, a final ruling is expected by Halloween.